:Today’s question comes to us from Marcelys from Venezuela. She wants to know about her back position in straight-legged seated forward fold/paschimottanasana. Hi, Melissa! It is always a pleasure to write you, because I am sure that you take your time to read all the comments that people let you 🙂 I always thank for your work. It is really a blessing! I recently saw your post about neck position in camel posture.That was really helpful!!! 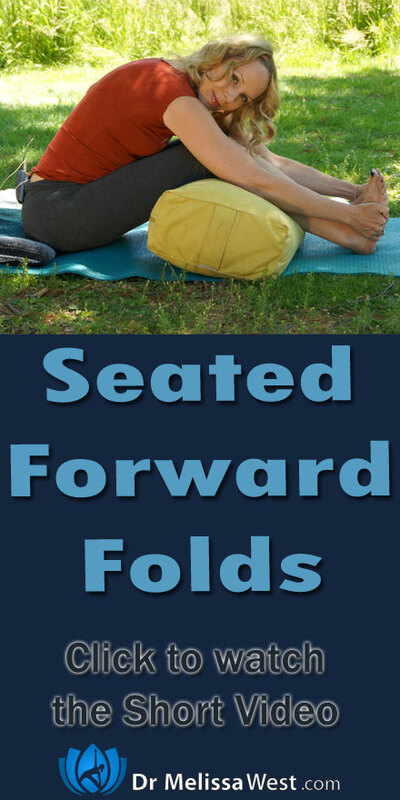 Once I saw the video, ocurred to me ask you a question that comes to me every time that I am doing the seated forward fold posture, with legs together. ¿How my spine should it be? That makes me nervous. When I am doing the pose, I constantly check my back to notice if it is straight. In order to free up your spine, you will need to be able to roll your pelvis over your leg bones. You can do this in a couple of ways. The most important thing is to keep the natural curve of your spine. In other words, in an effort to fold forward, try not to compromise the alignment of your spine by over-exaggerating the curve of your thoracic spine (upper back – kyphosis) or jet your chin out too much. Remember to engage jalandhara bandha and keep the natural curve of your cervical spine (your neck).